It is easy to understand why so few of the clubs that were originally for those engaged in manual work (‘tradesmen’) survive today. Most had a precarious existence, the majority were unlikely to be able to afford their own premises or even their own boats. When the boathouses that they hired craft from closed, or when the docks, wharves and warehouses that they rowed out of went out of business, the clubs disappeared. 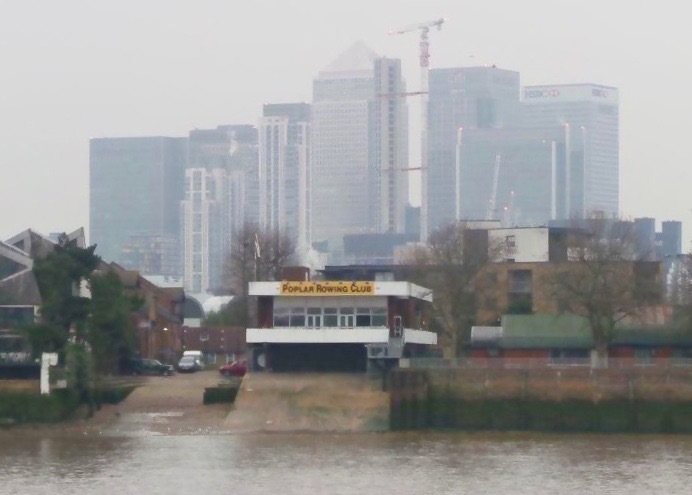 Of those few surviving former tradesmen’s clubs, perhaps the most notable is Poplar, Blackwall and District Rowing Club (PBDRC), based on the Isle of Dogs in East London, with its origins going as far back as 1854. 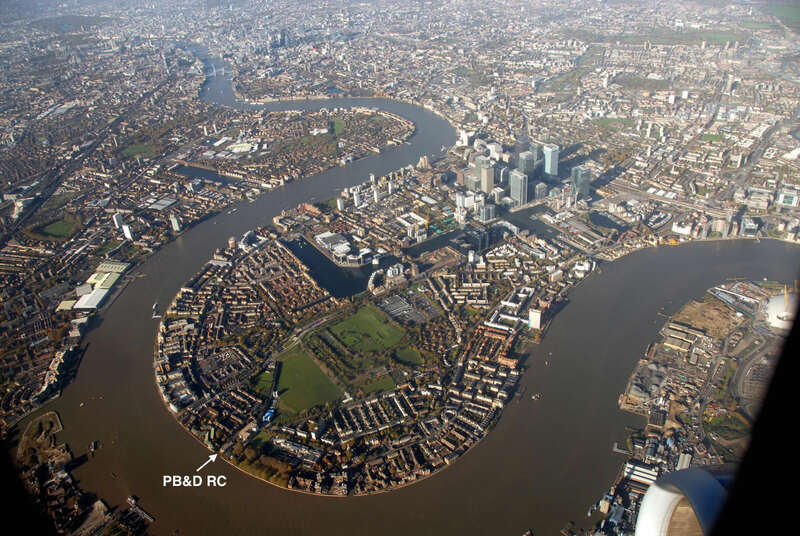 Poplar, Blackwall and District RC has had three different locations on the Isle of Dogs since it was founded. 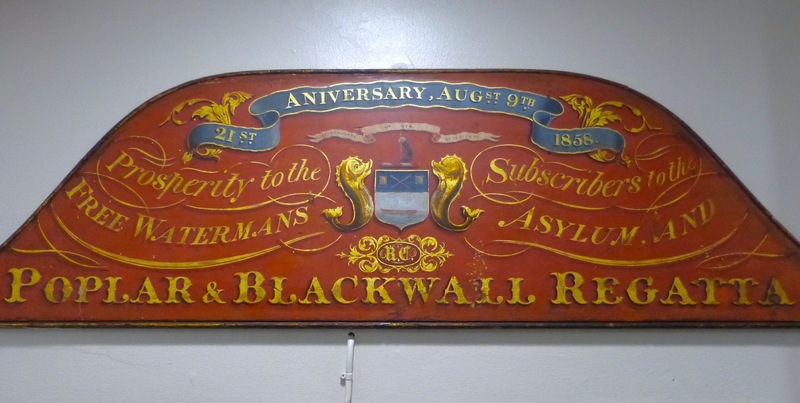 The club’s original name was ‘The Blackwall Rowing and Athletic Club’, based in the ‘Lifeboat’ pub. The club moved onto a site adjacent to its current location in 1937 and based itself in and around the former ticket office of the closed down North Greenwich Railway Station. It built its current capacious (if utilitarian) boathouse next door in 1970. 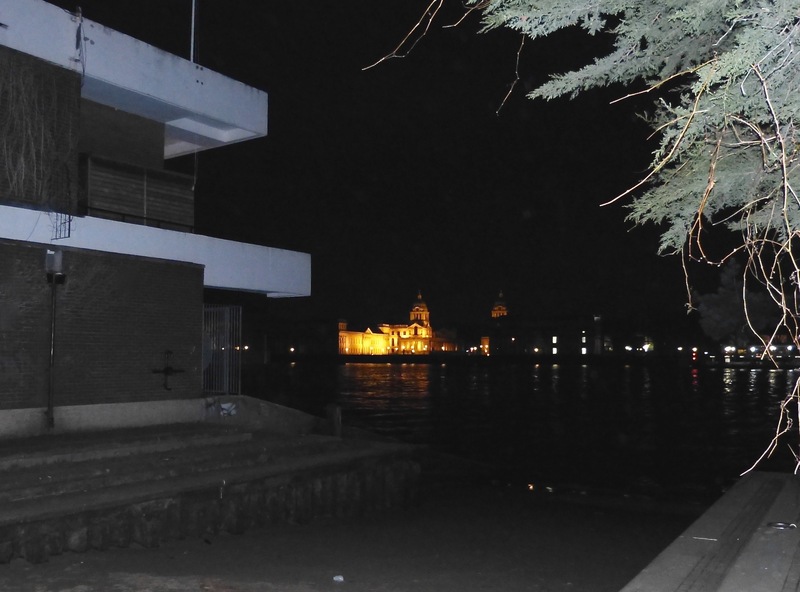 Historically, the members of rowing clubs such as Leander, Thames and London may have been higher up the social scale than the watermen, lightermen and dock workers who traditionally made up the membership of PBDRC – but none of those ‘Grand Old Clubs’ overlooks a World Heritage Site. Poplar is almost opposite the Christopher Wren masterpiece that is the old Royal Naval College. A splendid set of pictures showing this is here. PBDRC with the skyscrapers of ‘Canary Wharf’ in the background. Picture: @PBDRC. The Isle of Dogs with the City of London in the background photographed from over the river in Greenwich in 2015. The same scene as above captured in 1805. The one common point of reference is St Paul’s Cathedral, marked with an ‘x’ and on the left in both pictures. Two hundred years ago, the tallest buildings were dedicated to God. Today, the highest structures serve mammon. I had long wanted to visit PBDRC, partly because of its importance in rowing history and partly because I have often enjoyed the company of its members while attending the Doggett’s Coat and Badge Race. The dock workers are no more, but if a waterman or lighterman is going to join a rowing club, then Poplar, Blackwall and District is a very likely choice. I recently had my excuse to travel across London and spend an evening in a packed PBDRC clubhouse. 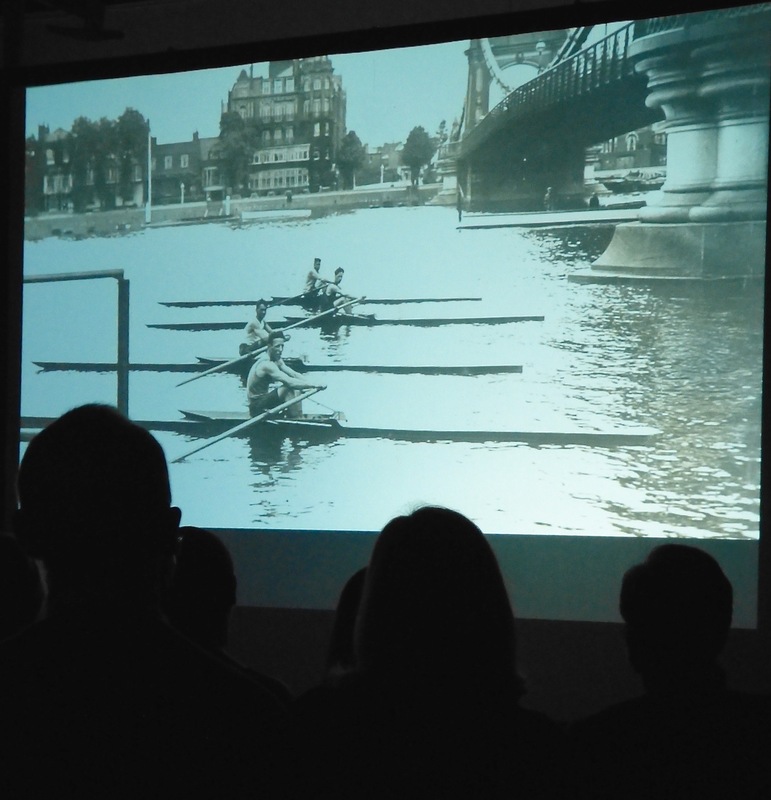 I had been invited to attend a screening of a new documentary, The World’s Oldest Boat Race. 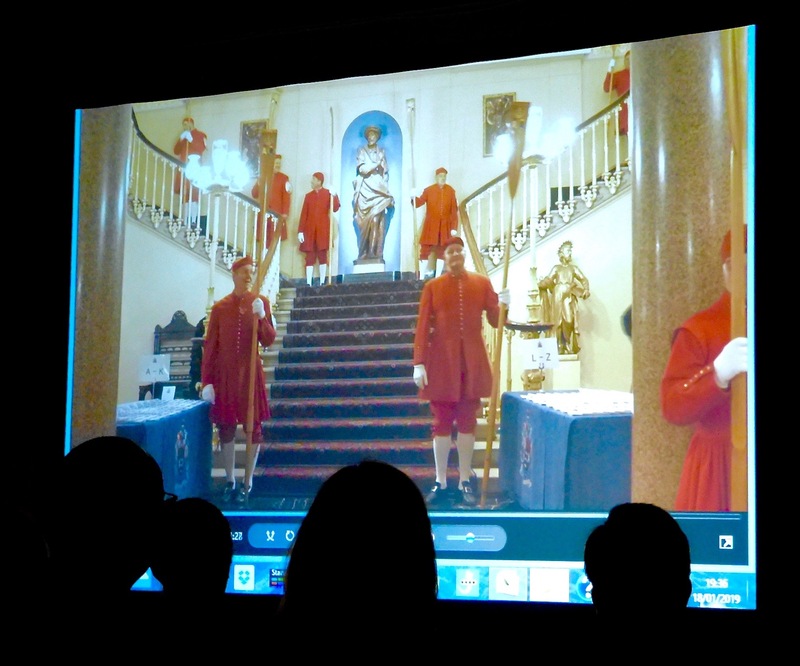 This film is part of the Thames Festival Trust’s heritage project exploring the history of the Doggett’s Coat and Badge. I will post exciting news about both the film and other work by the Trust very soon. Here, I am just going to chronicle my visit to the rowers of London E14. Despite being 164 years old, the club has few pieces of memorabilia from its early days on display. However, there was this nice item, a waterman’s prize ‘backboard’ for a wherry from 1858. 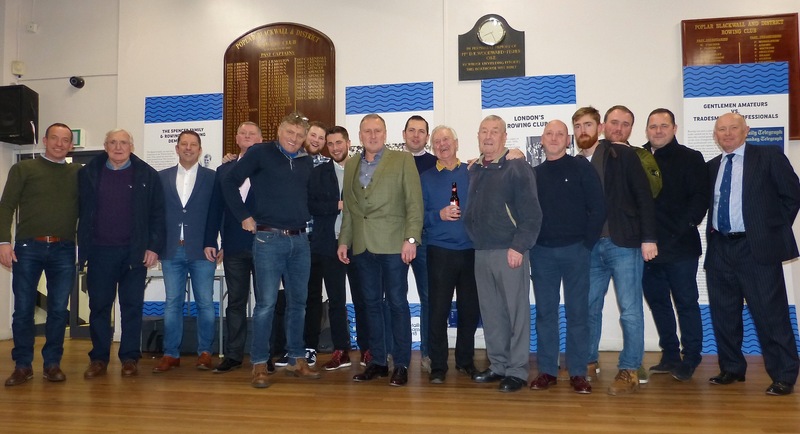 While the club has few very old artefacts on display, its real treasures are its members and supporters, both past and present. 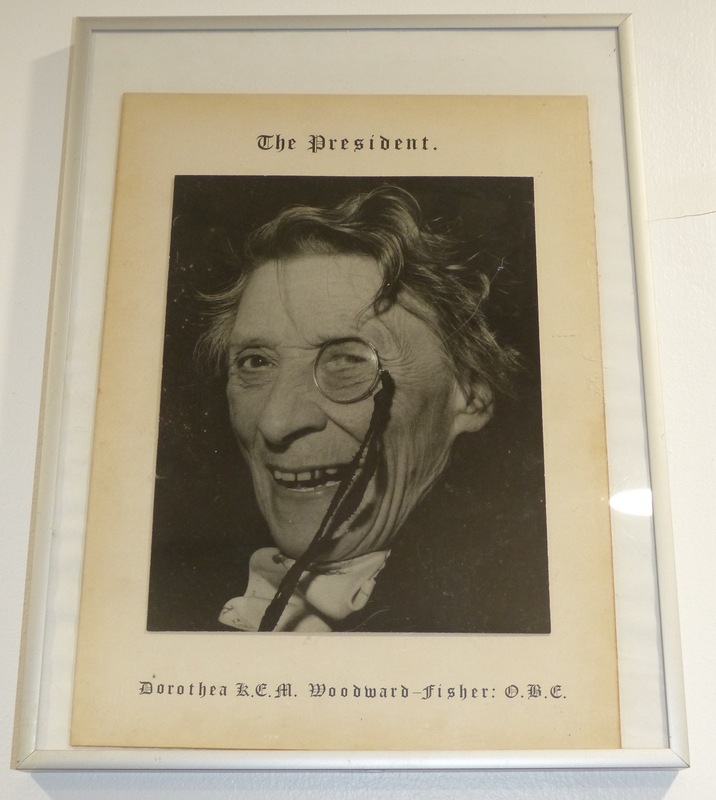 Dorothea ‘Dolly’ Woodward Fisher was, perhaps, an atypical member of Poplar, Blackwall and District, but she was, nonetheless, a long-time supporter, benefactor and president of the club. Dolly Woodward Fisher was educated at the prestigious Cheltenham Ladies College but, to her family’s distress, she married a lowly lighterman, William, winner of the 1911 Doggett’s. She ended up running a large lighterage business, transporting goods up and down the Thames. A woman who succeeded in a very tough, very male world, she dressed in man’s suit accessorised with a bow tie, monocle, and high-heeled crocodile shoes. 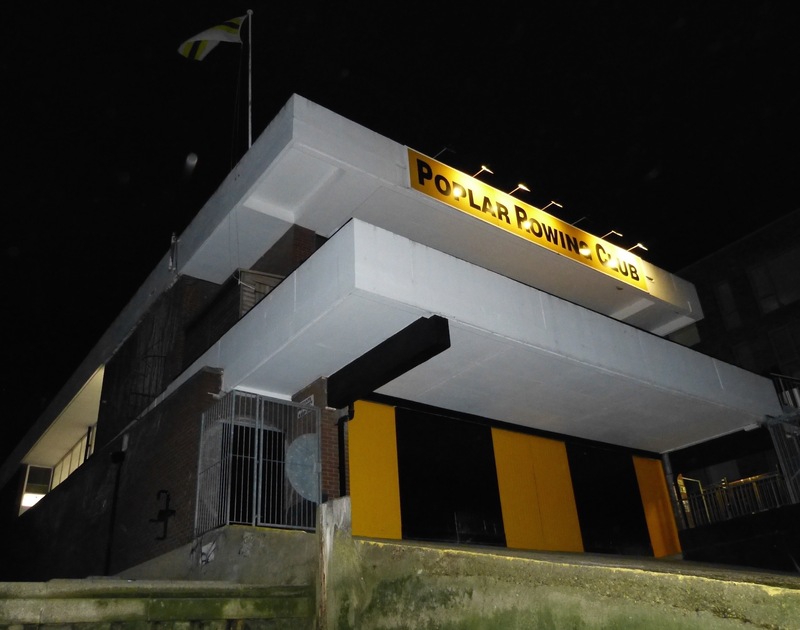 The current Poplar boathouse was largely paid for by the money raised by her tireless efforts. A wonderful film about Dolly is on Vimeo. There is a section on the club from 23 minutes and 18 seconds in. Sixteen winners of the Doggett’s Coat and Badge who attended the screening. In the centre (wearing the green jacket) is Chris Spencer, winner in 1987 and the current captain of PBDRC. The Spencers have worked on the river for 400 years. 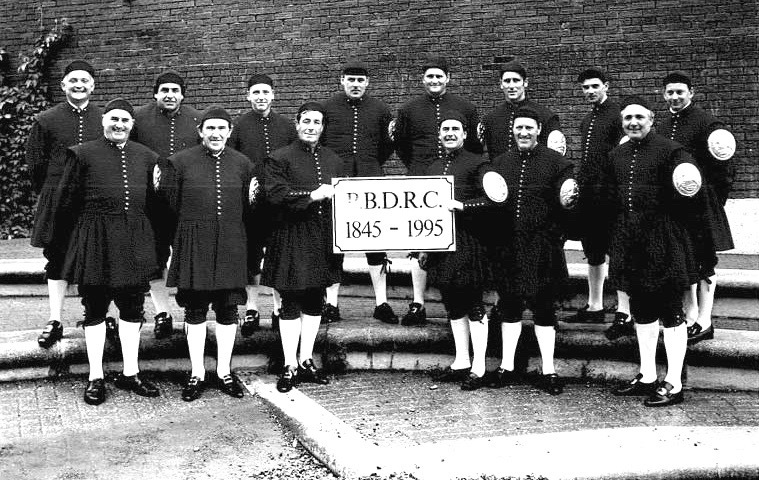 Some PBDRC members who have won Doggett’s at the club’s 150th-anniversary celebrations in 1994. 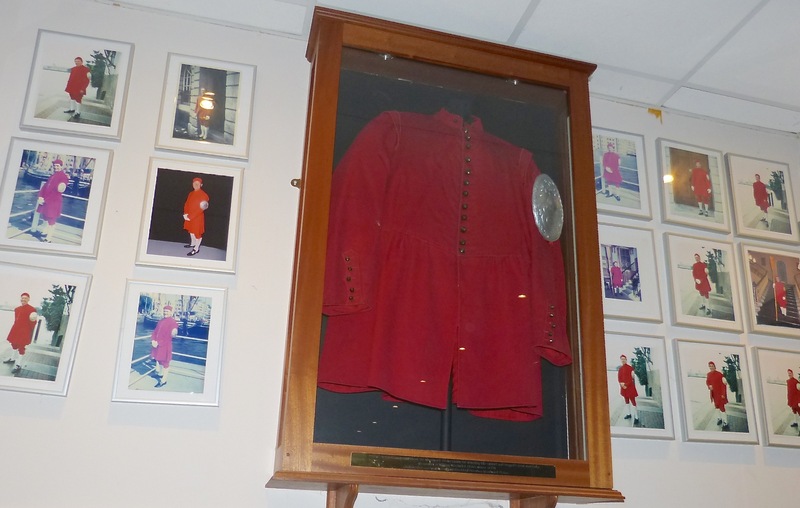 In Poplar’s bar, surrounding the coat and badge won by William Woodward Fisher in 1911, are pictures of just some of the many PBDRC men entitled to wear the prize garment. A family affair. 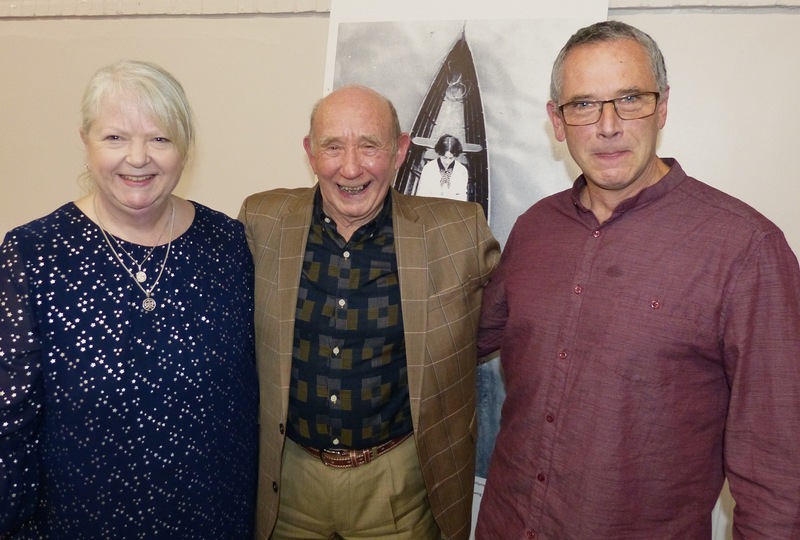 In the centre is retired waterman, John Hayes. On his right is his daughter, Claire Burran, who raced for Doggett’s in 1992 (the first woman to do so) coming third out of five. On John’s left, is his son, Glen, who won The Coat and Badge in 1988. At least seven generations of the family (via the Coles) have been watermen. Dave Miller (left) and Ronnie Watkins (right) rowed against each other in the 1952 Doggett’s. Dave came third and Ronnie fourth. Ronnie sports the Doggett’s tie that all competitors are entitled to wear. On the left is George Cole and on the right is Frankie Barritt. 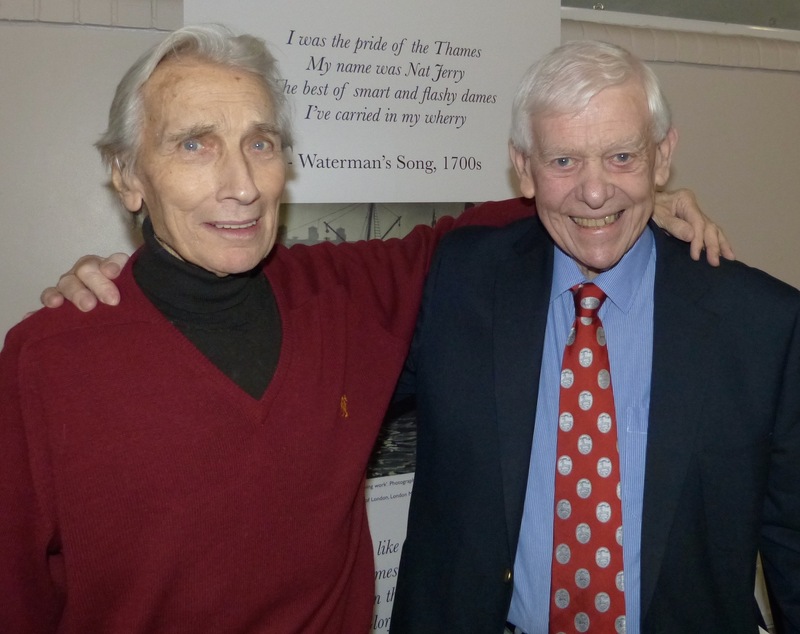 They are two of the three surviving members of the Poplar ‘lighterman’s eight’ who, in 1956, were the first ‘professionals’ to row at Henley Royal Regatta when the club entered the Thames Cup. Frankie told me that the eight had only got together six weeks before Henley – unlike their well-trained opponents. 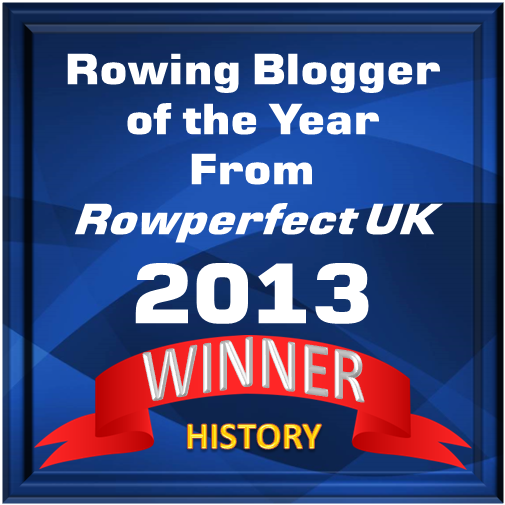 He remembers that their training included performing a thousand consecutive rowing squats. 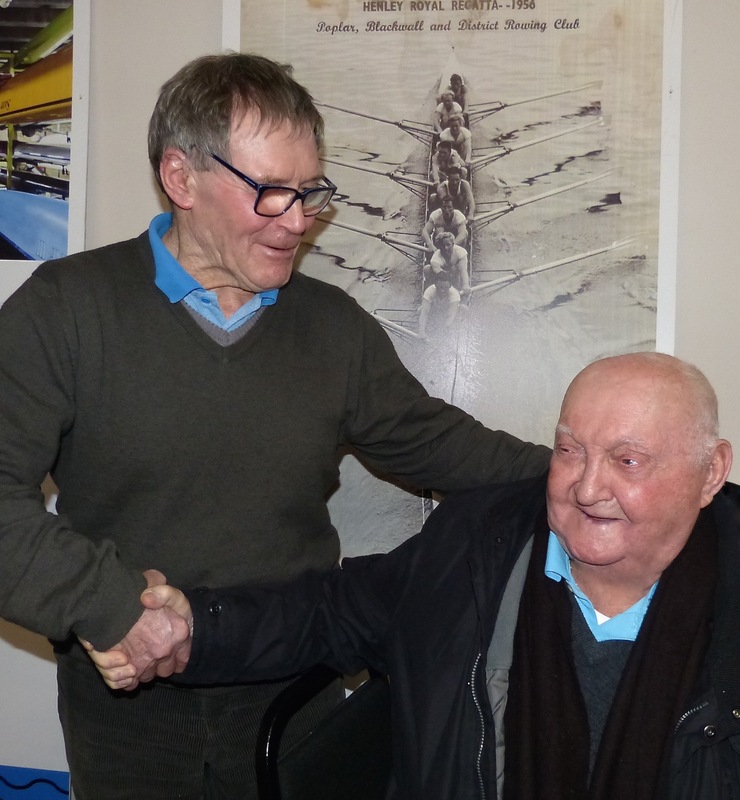 The two coaches were legends of the rowing world: Ted Phelps and the 87-year-old Jack Beresford Senior. Poplar’s 1956 entry for the Thames Cup. In their first heat in the 1956 Thames Cup, Poplar beat University College, Dublin, by 2 3/4 lengths in a time of 7 min 20 secs. They recorded the fastest time of the day for the Thames Cup and The Times called them ‘impressive’. In heat two, they beat Queen’s University, Belfast, by 3/4 length in a time of 7 min 28 secs. On day three, Poplar beat Bristol University by four feet in 7 mins 19 secs. 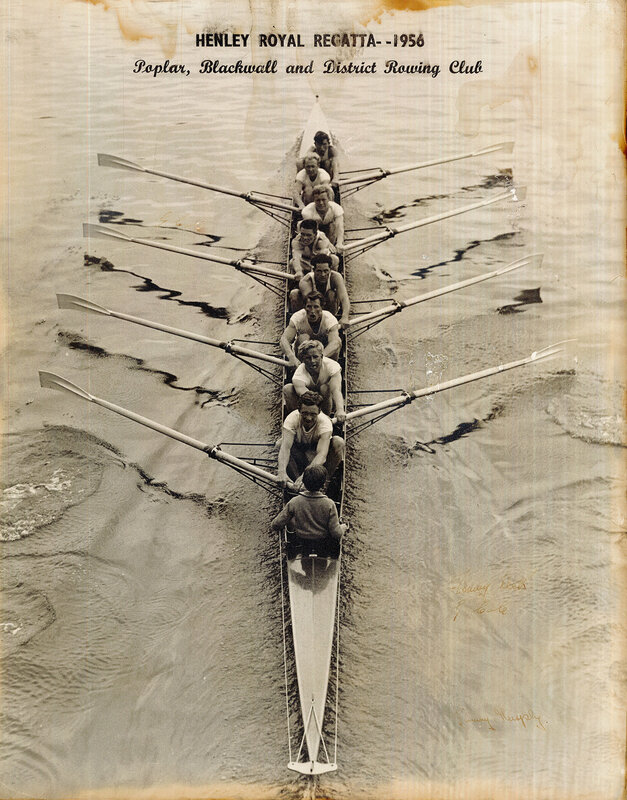 In the semi-final, they lost by one length to the Jumbo Edwards’ RAF crew who, in turn were beaten by the same amount in the final by Princeton University, USA. The Times said that Poplar ‘did splendidly to get so far at their first attempt’. Remarkably, there is brief newsreel film of the crew and Beresford Senior at Henley on the British Pathe site. The report on the 1956 regatta (‘One of the gayest sporting events of the English summer’ according to the commentator) starts at 1 min 4 secs. George, Frankie and friends are at 1 min 18 secs. 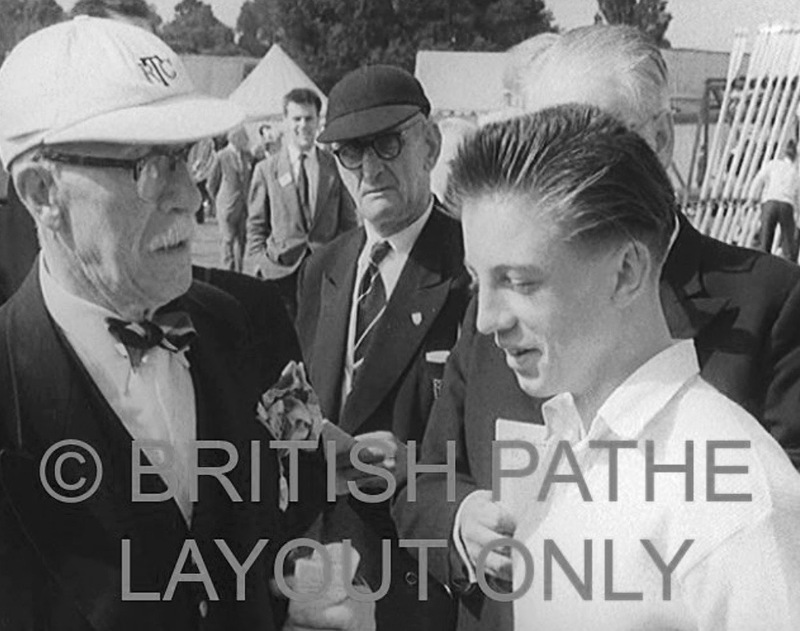 A still from the Pathe Newsreel showing PBDRC at Henley in 1956: Poplar’s 87-year-old coach, ‘Berry’, and the 16-year-old cox. 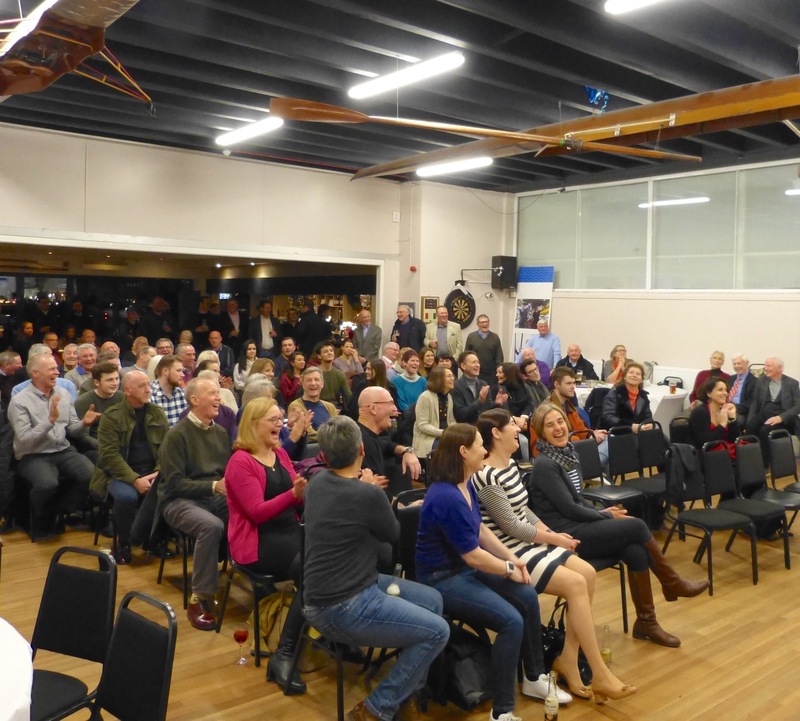 The audience for the screening of the new Doggett’s documentary are entertained by the words of welcome from club captain, Chris Spencer. Despite their hospitality, I always feel a bit of an intruder at gatherings of watermen and their families. Not only do most know each other, but many are related in some way; their parents, grandparents, and ancestors before them all inhabited the same small world that clung to the banks of the River Thames. Viewing “The World’s Oldest Boat Race”: Preliminary heats at Hammersmith. Viewing “The World’s Oldest Boat Race”: The latest winner is introduced at Fishmongers’ Hall. Superb article. I loved this line: “For years we used to have East End people eating posh food, now we have posh people eating East End food.” Rowing for all! Very good that, but one section has got me wondering – the reference to a ‘Lifeboat’ pub. I’ve written more than a few blog articles about the Isle of Dogs (including one about Dolly Fisher: https://islandhistory.wordpress.com/2017/02/19/dolly-fisher-tugboat-annie-of-the-thames/), but have never heard of this pub. Can you say where you got the name from? My own association with the rowing club extends to not much more than parties and ‘do’s’. I did once in the 70s tried to sign up as a proper rowing member, but when I revealed I could hardly swim, I didn’t get beyond the training tank. From records this club was formed roughly about 1854 by a group of young boys who wanted to row a boat. They could of course have been called “Would be oarsmen”. These young lads, and possibly their fathers, cadged from all and sundry and got one or two old boats together. They made their headquarters a pub known as the “Lifeboat” – later pulled down for the new tunnel (Blackwall). The boys evidently kept their boats in publicans backyards, and the boats were launched at Chalkstone Bouys, Millwall Stairs and the Dust Shute at Poplar Dock Causeway before it was closed, and sometimes at the upper end of South Dock.